Gather your family to celebrate Irish heritage 2013 in Belfast, Northern Ireland. Belfast is more than foam, froth, and bubbles. It’s a hip cultural city that boasts the new Titanic Belfast Museum, the Metropolitan Arts Center, and a constant stream of music festivals. Long past “The Troubles,” Belfast now brims with hope and humor ideal for a family weekend. Symbolic murals represent the history of those political conflicts and promote Republican or Loyalist beliefs but now also include commemorative or cultural symbols. Since the 1990s, Falls Road is the area that has become a destination for tours that include murals of revolutionaries and the neighboring Unionist Shankill Road that is separated by the Peace Wall. President Clinton’s and the Dali Lama’s names are engraved and visitors add comments on the adjacent walls. 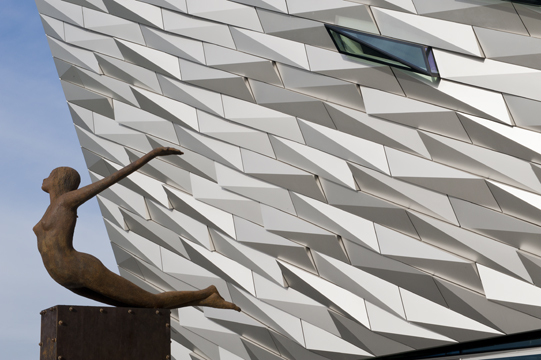 The Titanic Belfast Museum, Northern Ireland Tourism’s signature project, exudes optimism. The four exterior 90 ft. hulls, clad with anodized aluminum, sparkle and shimmer like the prow of the ship on the original site. At the museum’s entrance and reminiscent of nautical figureheads, the brass sculpture’s, “Titanica’s,” uplifted arms perhaps represent the future. Interactive state-of-the-art exhibitions tell the story of the Titanic from inception and construction to the aftermath. Innovative displays reveal shipbuilding, interiors, and launch. The Shipyard Dark Ride overlooks full-scale reconstructions and uses special effects to bring a reality of being there years ago. Sound effects of hammering, videos of descending elevators, and animation of workmen create an exciting theatrical illusion. Titanic buffs could spend the entire day at the museum along with additional Quarter tours that follow the legacy. The master plan for the Titanic Quarter combines the development of residential, business, and cultural spaces with parks and gardens. The tradition of farm-to-table cooking takes on a modern twist at the sophisticated restaurant, James Street South in Belfast City Center. Seasonal and locally sourced products paired with a classical French approach, resulted in a memorable meal. The plump and briny scallops coveted earlier at St. George’s market were perfectly seared with a resulting caramelized sweetness. The Lissara duck breast served with mustard fruits and a puree of port and fig complimented the tangy cavolo nero kale. 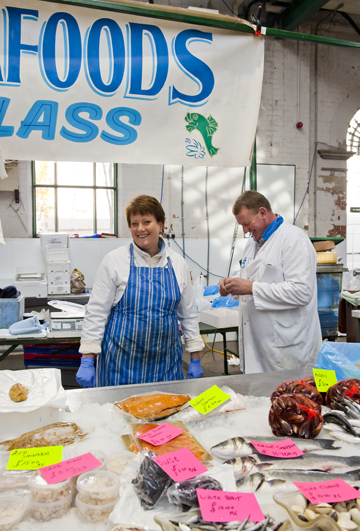 If still hungry after exploring some of Belfast’s more elegant gastronomic choices then head to St. George’s three-day-weekend market built in the 1890s where fishmongers sell shellfish so fresh it bubbles. Grab a snack, listen to live music, and shop for regional food and hand-loomed scarves. After years of neglect, the renovated Victorian market with seventy cast-iron columns that support the spacious and bright interiors reopened as a major destination in 1999. 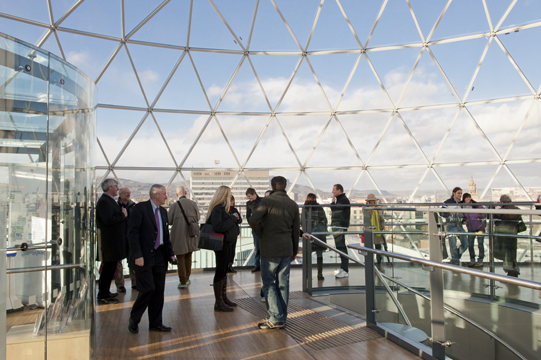 For a spectacular 360-degree view of the city, as well as a view of what revitalization projects have done for Belfast’s spirit and commercial center, take the elevator to the top of the glass-domed, multi-level shopping center, Victoria Square, completed in 2008. Interactive workshops and lectures welcome parents and children for an hour or more, along with classes for emerging talent. 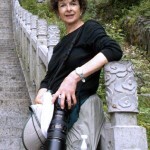 Exhibitions, performances, and experimental work also showcase international and local culture. When children prefer Egyptian mummies and dinosaurs to music and dance, head to the free Ulster Museum. It offers educational alternatives with traditional crafts and natural history in their workshops and Discovery Centers. 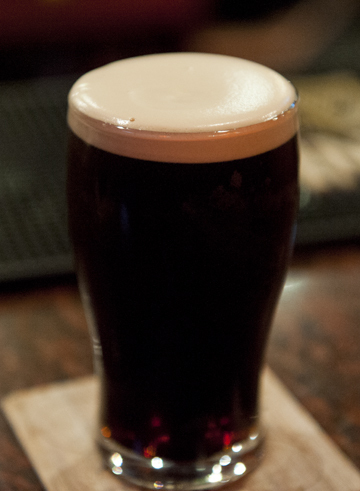 Neighborhood pubs aren’t just a quick stop for the perfectly pulled pint of a rich and creamy Guinness with foam still clinging to the rim. Pubs function as social centers where families and fun-loving friends listen to the rich heritage of traditional folk music. 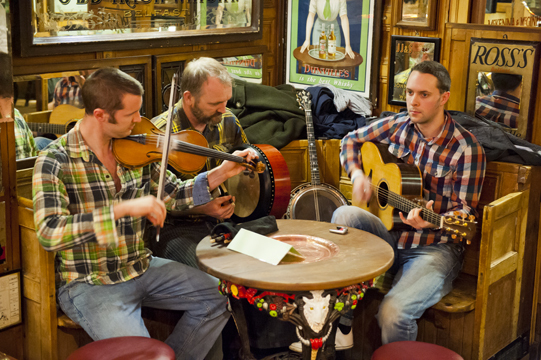 Next to a Cathedral Quarter’s cobblestone alley and inside the Duke of York, its walls lined with advertising mirrors touting whisky manufacturers, a fiddler, guitarist, and drummer on the bodhrán play those haunting melodies for themselves, as much as for the patrons. Belfast is literally a city of on-going music and festivals. Van Morrison’s, the legendary Belfast blues singer’s, loyal fans loudly applauded at the 50th Belfast Festival at Queens. The annual festival, held at venues throughout the city, included the Buena Vista Social Club, children’s puppet shows, and theater. Belfast Music Week showcases a November festival and lists year-round music: opera, chamber, classical, jazz, rock and pop, and hip-hop. The iconic 19th c. Grand Opera House and Cirque boasts Luciano Pavarotti among its great performers. After the theater or gig, grab a taxi to the awarding-winning Merchant Bar for cocktails with “elegant and refined style,” according to their menu. The buzz from the crowded bar tables filled with casually dressed singles and couples ­­­–– no standing allowed –– is the perfect place to end an evening. The Aviation, a drink with a pedigree, mixed with Crème de Violette, gin, maraschino liqueur, and a splash of fresh lemon juice for perfect balance, referenced the early 1900s birth of airplanes and flying with its purplish-sky blue tint. A frothy Powers Irish coffee with thick whipped cream and a slight bite would warm anyone’s heart. Easily accessible, Belfast is two hours from Dublin’s International Airport by bus and slightly longer from the Dublin’s City Center railway station. Travelers to the United States clear customs and immigration in Dublin. Those are the most cheerful fish mongers I’ve ever seen. Love the bright blue apron!